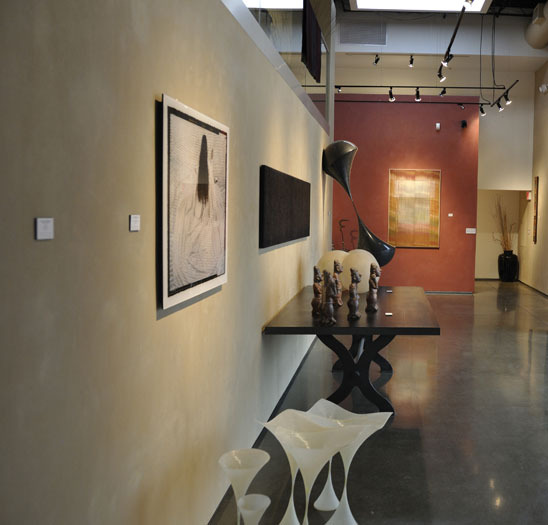 Albuquerque, NM (October 2010) – American Clay Enterprises, Inc. has created a game-changer in cost and durability for commercial interior wall finishes. Our new PlasterPlus™ binder is added to the American Clay earthen plasters, resulting in a hard, yet repairable, No-VOC finish for the cost of a high quality, Zero-VOC paint job. PlasterPlus™ is sold dry in 27 lb. lots through select commercial distributors, and is intended for commercial projects—such as healthcare, hospitality, universities—and big build residential. The polymer binder has No-VOCs, is mold resistant, extremely easy-to-apply, and still can contribute up to eight (8) LEED points—along with singularity and timeless beauty—to any project. No wonder the field response has been ardently positive thus far. American Clay has been used for numerous commercial / industrial jobs to date—from hotels (including Disney) and retail to schools, colleges, spas and churches. (Partial list attached.) Now with PlasterPlus™ , American Clay can replace paint more equitably: for 80,000 sq. ft. projects, the cost can come in as low as $1.00 per sq. ft., including labor and product. Adding the completely repairable binder to the single-coat commercial Enjarre™, as well as to any of the color-integral American Clay premier Legacy products, results in the easiest, hardest surface application of American Clay to date, and at the cost of both your texture and your “Zero-VOC paint”. ∗∗ Product cost as low as $.38 per sq. ft. for Enjarre™ one-coat application system. Added hardness and increased ease of application. ∗∗ Longevity outlasting a painted wall, creating cost, labor and time savings. It does not need to be repainted for the life of the walls because the clay itself resists dirt and grime. ∗∗ Resistance to fading due to he natural mineral pigments. ∗∗ Highly suitable for economical spray-on application in one- or two-coat systems. ∗∗ Creates less than 5% on-site waste of material during application. ∗∗ Unlike other acrylic, gypsum or lime specialty finishes, walls coated with American Clay plaster with PlasterPlus™ can be wetted and reworked after application (without adding additional binder) to achieve desired results and yet is hard and durable. ∗∗ Cleanup is much quicker and easier than with paint, since there is no thick latex binder involved. ∗∗ As with the Legacy products, this new binder is a No-VOC, Zero Formaldehyde choice for your walls, bringing humidity and temperature moderating qualities to your project’s interior environment. ∗∗ As with the Legacy products, unlimited visual and textural possibilities. Just like American Clay’s existing product line, PlasterPlus™ is suitable for most substrates. It will be sold in dry 27 lb. lots. PlasterPlus™ is available through select commercial distributors; please contact sales@americanclay.com for a list. Our countrywide system of approved applicators will be able to purchase this product in bulk for their projects. “Our crew worked with PlasterPlus for the first time last week. They texted me from the project site to say how awesome the product is. The workability made the install easier and they were pleased with the look. They found compression to be “like a dream” and loved the result. The clients were delighted. American Clay is also posting today on http://www.americanclay.com under “Professional –> Commercial Projects” page: the PlasterPlusTM sellsheet, MSDS sheet, application instructions and a FAQ. American Clay Enterprises, Inc., based in Albuquerque, NM, produces patented, award-winning, all-natural interior wall finishing products. Their Earth Plasters, the commercial ENJARRE™ single coat plaster, and its new PlasterPlus™ binder offer a unique combination of clays, aggregates and natural pigments that offer builders and consumers a natural, durable and unique option. There is no off-gassing nor inherent waste on-site. The plasters contain no VOCs, are non-flammable, are mold resistant (without toxic fungicides), absorb odors, provide temperature and humidity buffering, repair/clean easily and come in recyclable packaging. American Clay, with an extremely low carbon footprint, is uniquely manufactured in the U.S. and made of materials found in the U.S. The products and various workshops are available through their New Mexico office or through their retailers and distributors across the U.S. For information on products, ordering, technical specifications, product application and additional resources and links: http://www.americanclay.com.